I am currently studying the book The New Digital Age by Executive Chairman of Google Eric Schmidt and Jared Cohen, Director, Google Ideas. It's both a scary and enlightening read. The authors state that soon connectivity i.e. access to the internet will be available to every human being. While this will be a great thing I have been reflecting that connectivity doesn't necessarily mean connection. How many people are you connected to via the internet/social media whom you actually have a real human connection with? If you are like me your answer is, not many. I am of the view that regardless of how great technology becomes it will only ever be a tool for living, not the be all and end all some people seem to think it is. What has always mattered and will always matter is real human connection. 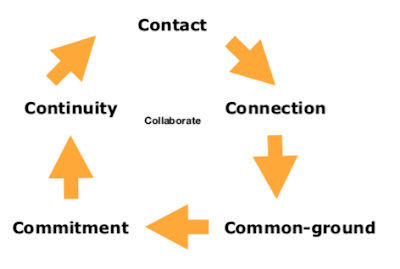 We live in a connection economy for sure. The pay off though is not about economics, it is about how real human connection enriches our lives. Another book I have been reading lately is Million Dollar Referrals by Alan Weiss. I have been following Alan's advice in my own way for more than a decade because it works. In Million Dollar Referrals Alan highlights the power of in-person connection. As you Tweet, Like, Google+ and carry out your choice of the zillions of activities available via the Internet and Social Media reflect on these questions; do you have harmony between what you do online and in-person? Are your online and in-person actions benefitting one another? Life is always a both/and never an either/or. Pain and pleasure, relationships and tasks, women and men, leadership and management, life is a myriad of opposites. The trick is the relationship harmony point between opposites. Online and in-person are no different. I can easily share and spread what I am passionate about. I can easily share and spread what my friends and colleagues are sharing that I feel others would value. It makes my life simpler. It enhances my visibility, credibility, searchability, and approachability, all of which are key to my business success. I love the ease of which I can do research, a key to all of my work. I love the fact that community with people I have shared passions with is enhanced online. I love the fact that I can provide my clients with resources they find valuable that you can have 24/7 access to whenever it suits you. There is nothing like being in the room, being truly present with other human beings. My great value to my clients is in-person. Do you have harmony between what you are doing online and in-person? Are both leading you to deeper human connection with those you love and those you do business with? One of the great reminders of reading Million Dollar Referrals is that most of my business over 22 years has come directly and indirectly from relationships of high-value and mutual reward with less than a dozen people. We have connectivity. One day soon this will mean everyone on the planet will be at our doorstep. What matters though is not the masses. What matters is the relatively few people in our lives with whom we have a deep emotional human connection.